Let's make things more colorful by learning Russian vocabulary for colors (цвета́)! 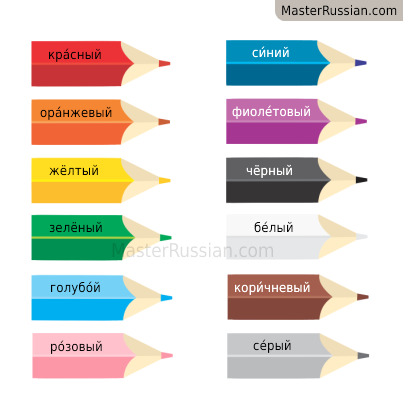 Just look at the picture and learn the name of the color in Russian. Then listen to audio recordings and practice saying the new words yourself. Here's a good mnemonic to remember the names of the colors of the rainbow in Russian. The first letter of each color's name matches the first letter of each word in this phrase — Каждый (красный - red) Охотник (оранжевый - orange) Желает (жёлтый - yellow) Знать (зелёный - green) Где (голубой - sky blue) Сидит (cиний - blue) Фазан (фиолетовый - violet, purple). It can be translated into English as "Every hunter wishes to know where the pheasant sits." Once again "Каждый охотник желает знать где сидит фазан". A fun fact! Russians consider the colors "blue" and "sky blue" to be distinct colors rather than two shades of "blue". If you want to look at the world as Russians do, then you have to learn two separate words for these colors. Luckily, this page with audio recordings is a fantastic way to get the pronunciation of the Russian colors perfect from the very beginning. You can go back to the Russian picture dictionary to learn even more Russian words. There is also a section on Russian culture if you are looking for fun ways to learn Russian and understand Russians better.